THE logistics industry in Singapore has come up against obstacles in attracting young talent even as demand for labour in the sector grows, prompting the industry and government to look for ways to improve the situation. The hiring challenges come out of a mismatch of expectations, lack of awareness of the nature of the industry and the appeal of alternative careers. Lee Eng Keat, the director of logistics at the Singapore Economic Development Board (EDB), said that feedback from logistics companies is that the expectations of young graduates coming out of schools is "fairly high". But then companies in the sector are also guilty of harbouring high expectations, in that they expect graduate applicants to have some form of experience in supply-chain and operations. "So there is some sort of mismatch right now in terms of the expectations of the roles and responsibilities," he said. Mr Lee said that, to overcome this, the industry and government agencies have begun working with schools to expose students to the needs of the sector and infuse training in the curriculum. He was speaking to reporters at the launch of one such initiative called The Fresh Connection - a competition in playing a web-based supply-chain business simulation game; participation has been thrown open to students from the local polytechnics and universities, as well as industry teams of young corporate professionals. Non-profit industrial body Supply Chain Asia (SCA), the EDB and the Singapore Workforce Development Agency (WDA) are behind it. Mr Lee said such initiatives help to close the "training gap", since training and retraining young talent is critical to the development of the logistics and supply chain management industry in Singapore. The industry typically looks to hire business or engineering graduates, but it has evolved in such a way that companies are also on the lookout for mathematicians, for example; such individuals will find their skills relevant in supply-chain analytics, SCA founder and president Paul Lim told reporters at the launch. But awareness of the industry - or rather, the lack of it - is a problem. Young graduates may not be aware of the developments and advancements made in the sector. Mr Lee said: "What may not be as intuitive or come naturally to the younger generation is the sophistication level (of the industry), because often, logistics is defined as the physical movement of goods." And then there is the problem of the logistics sector not being the first-choice industry graduates think of for a career, unlike the legal, medical or banking and finance sectors. Mr Lim quipped: "This is disappointing because we are a very exciting industry… and have gone beyond the moving of boxes." As of last year, Singapore had 192,600 logistics professionals, making up 9 per cent of the total Singapore workforce. The demand for logistics professionals is growing here, as the sector is rapidly establishing itself as a key pillar of the Singapore economy. 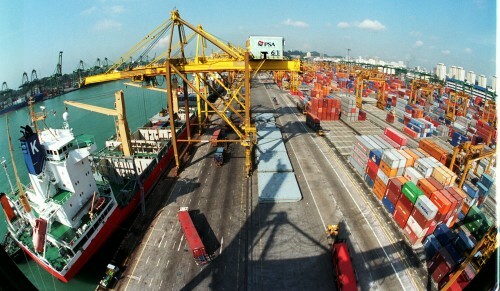 The SCA said Singapore has been ranked by the World Bank as Asia's No.1 logistics hub in the 2014 Logistics Performance Index. Of the world's top 25 global logistics players, 20 have set up operations in the Republic; Singapore's transportation and storage sector contributed about 7 per cent to the national GDP in 2013. Mr Lee said that the upshot of the talent crunch in the sector has been a great clamour for foreign workers among logistics firms. In response, the government has encouraged the sector to aim for productivity gains through innovation to ease the labour shortage. To Mr Lim's observation that salaries have gone up in the industry as the competition for talent heats up, Mr Lee said that though this may help attract fresh blood, employers in the sector are concerned that the younger generation may take advantage of the situation and switch jobs more frequently. Besides The Fresh Connection game, the industry has teamed up with government agencies to look at other solutions. Mr Lee cited the work of Aspire (the Applied Study in Polytechnics and ITE Review) Committee as a key initiative in this regard, as the committee will review and recommend enhancements to the applied education model of the polys and ITE. In addition, continuing education in logistics-focused courses will also play an important role for those already in the workforce.